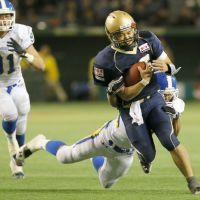 The Japan X-League’s Obic Seagulls defeated Kwansei Gakuin University 21-15 in the Rice Bowl at Tokyo Dome on Thursday. It was the third straight year in which Obic had triumphed in the annual American football national championship game between Japan’s corporate and university champions. Seagulls quarterback Shun Sugawara was named the game’s MVP for the third consecutive year. Obic’s sixth Rice Bowl title saw the corporate squads improve to 18-12 in the 30th edition of an event that was first staged in 1984. Kwansei, which was looking for its first national title in 11 years, also lost last year’s game, when Obic came from behind to win with a touchdown in the waning seconds.